Arthur D. Little is an international management consulting firm originally headquartered in Boston, Massachusetts, United States, and formally incorporated by that name in 1909 by Arthur Dehon Little, an MIT chemist who had discovered acetate. Arthur D. Little pioneered the concept of contracted professional services. The company played key roles in the development of business strategy, operations research, the word processor, the first synthetic penicillin, LexisNexis, SABRE and NASDAQ. Today the company is a multi-national management consulting firm operating as a partnership. The roots of the company were started in 1886 by Arthur Dehon Little, an MIT chemist, and co-worker Roger B. Griffin (Russell B. Griffin), another chemist and a graduate of the University of Vermont who had met when they both worked for Richmond Paper Company. Their new company, Little & Griffin, was located in Boston where MIT was also located. Griffin and Little prepared a manuscript for The Chemistry of Paper-making which was for many years an authoritative text in the area. The book had not been entirely finished when Griffin was killed in a laboratory accident in 1893. Little, who had studied Chemistry at MIT, collaborated with MIT and William Hultz Walker of the MIT Chemistry department, forming a partnership, Little & Walker, which lasted from 1900 to 1905, while both MIT and Little's company were still located in Boston. The partnership dissolved in 1905 when Walker dedicated all of his time to being in charge of the new Research Laboratory of Applied Chemistry at MIT. 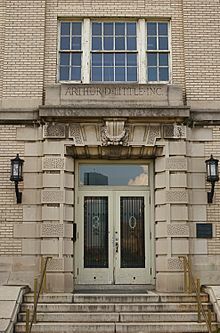 Little continued on his own and formally incorporated the company, Arthur D. Little (ADL), in 1909. He conducted analytical studies, the precursor of the consulting studies for which the firm would later become famous. He also taught papermaking at MIT from 1893 to 1916. In 1917, the company, originally based at 103 Milk Street in Boston, moved to a building of its own, the Arthur D. Little Inc., Building, at 30 Memorial Drive on the Charles River next to the new campus of MIT, which had also relocated from Boston to Cambridge. The building was added to the National Register of Historic Places in 1976. In November 1953, ADL opened a 40-acre site for its Acorn Park labs in west Cambridge, Massachusetts, about 6 miles (10 km) from MIT. The new site took its name from the company motto - "Glandes Sparge Ut Quercus Crescant," translated as "Scatter Acorns That Oaks May Grow." The Memorial Drive Trust, a tax-exempt retirement trust for the benefit of its employees, was set up. From 1972 to 2001 ADL owned Cambridge Consultants Ltd in Cambridge UK and both companies forged close links. In 1911 ADL organized General Motors' first R&D lab, leading to the formation of the firm's dedicated management consulting division, and the birth of the management consulting industry. In 1916 ADL was commissioned by the Canadian Pacific Railway to do a survey of Canada's natural resources. In 1921 the firm succeeded in using a bucket of sows' ears to make a silk purse. This revolutionary achievement later became part of the Smithsonian Institute's collection. In 1968 ADL designed the NASDAQ stock exchange systems for London and Tokyo. In 1980, ADL produced the European Commission's first white paper on telecommunications deregulation, having completed the first worldwide telecommunications database on phones installed, markets, technical trends, services and regulatory information. It also helped privatize British Rail, generally regarded as one of the most complex privatization exercises in the world. By 2001, Arthur D. Little reached its peak as a global consulting firm. However, a new management team mismanaged the company's core business and engaged in manipulation of the Memorial Drive Trust. The ADL Board of Trustees replaced this management team. However, the damage had been done, and Arthur D. Little filed Chapter 11 bankruptcy protection in 2002. At an auction in 2002, Paris-based Altran Technologies bought the non-U.S. assets and brand name of Arthur D. Little. Under Altran's ownership, Arthur D. Little operated primarily as a European-centric company initially, rebuilding and strengthening its core practices in oil and gas, telecommunications, automotive, manufacturing, and chemicals. Later ADL grew and expanded throughout Europe, the Middle East, and Asia and continued to be recognized for its expertise in areas combining aspects of technology, innovation, and strategy. A group of partners led a management buyout from the Altran group in 2011. The MBO was completed on 30 December 2011 with the vast majority of ADL directors becoming partners and shareholders. A small number of principals, as well as the CFO and COO, are also shareholders. The firm is led by the elected Global CEO, Ignacio Garcia-Alves, who was also the leader of the MBO team. Currently the firm operates with an elected board of directors and several elected committees - Compensation Committee, Partnership Committee, and an Audit Committee. Since the MBO, ADL opened new offices in Turkey, Oslo, Buenos Aires, Singapore, and Hong Kong. In addition, ADL recently re-established itself in the US market and has opened offices in Boston, Houston, New York, and San Francisco. Arthur D. Little is organized across a number of industry specialty groups including Automotive, Energy / Utilities / Chemicals, Telecommunication / Information / Media / Electronics (TIME), Consumer Goods & Retail, Healthcare & Life Sciences, Engineering / Manufacturing, Public Services, and Travel & Transportation. Major service lines are in Strategy & Organization, Technology Innovation Management, Operations Management, and Risk/Safety. In 2019, Arthur D. Little is rated #10 and #11 in Vault's 2019 Consulting rankings for Europe and Asia respectively. ADL recently re-established itself the US market and has been recognized by Forbes in 2016, 2017, and 2018 as one of "America's Best Management Consulting Firms"  and made its debut as #34 in Vault's 2017 North America Consulting rankings. Guillebaud, David (2016). Disruption Denial: How Companies Are Ignoring What Is Staring Them in the Face. LID Publishing. ISBN 1910649775. Träm, Michael (2010). Innovate Your Company: Trends to Follow for a Competitive Advantage. Wiley. ISBN 9783527505227. Deneux, François; Rouach, Daniel; Louzoun, Steve (2010). Incubators of the World. Pearson. ISBN 2744064599. Scott-Morgan, Peter; Hoving, Erik (2001). The End of Change: How Your Company Can Sustain Growth and Innovation While Avoiding Change Fatigue. McGraw-Hill. ISBN 0071357009. Senge, Peter (1999). The Dance of Change: The Challenges to Sustaining Momentum in a Learning Organization. Crown Business. ISBN 0385493223. Deschamps, Jean-Philippe; Nayak, P. Ranganath (1995). Product Juggernauts: How Companies Mobilize to Generate a Stream of Market Winners. Boston: Harvard Business School Press. ISBN 0-87584-341-7. OCLC 31330407. Scott-Morgan, Peter (1994). The Unwritten Rules of the Game: Master Them, Shatter Them, and Break Through the Barriers to Organizational Change. McGraw-Hill. ISBN 0070570752. Jonash, Ronald; Sommerlatte, Tom (1994). The Innovation Premium: How Next Generation Companies Are Achieving Peak Performance And Profitability. Perseus Publishing. ISBN 978-0738203607. Nayak, P. Ranganath; Ketteringham, John M. (1994). Breakthroughs!. Pfeiffer. ISBN 0893842508. Roussel, Philip A.; Saad, Kamal N.; Erickson, Tamara J. (1991). Third Generation R & D: Managing the Link to Corporate Strategy. Boston: Harvard Business School Press. ISBN 0-87584-252-6. OCLC 22596604. Twice a year, Arthur D. Little publishes its latest thinking on strategy, technology and innovation in its corporate magazine Prism. Media Flow of Funds 2017 : Consolidate, Diversity, or Perish, which is the most recent in a multi-year study assessing the digital shifts in the content industry and the associated shifts in value along the industry ecosystem. Telecoms & Media Flagship Report 2017 : Major strategic choices ahead of TelCos: Reconfiguring for value which assesses how digitalization will impact telecommunication operators' configuration. In 1961, Arthur D. Little launched the first management education program to focus exclusively on training general managers from developing countries. Originally known as the Arthur D. Little Management Education Institute, this was a fully accredited academic institution with master's degree granting status. In 1996, the Arthur D. Little School of Management formed a partnership with Boston College's Carroll School of Management in order to gain access to faculty and facilities. The Arthur D. Little School of Management became Hult International Business School in 2002, following a structural reorganization of Arthur D. Little Inc. In 1987, ADL claimed that sabotage was likely the cause of the Bhopal disaster, which resulted in the death of thousands. ADL's investigation was funded by Union Carbide, the company that owned the chemical plant responsible for the chemical disaster. Analysis by Arthur D. Little argues that the Negligence argument was impossible for several tangible reasons. In 2001, ADL wrote a Philip Morris-funded report saying that smoking can help Czech economy: Public Finance Balance of Smoking in the Czech Republic. William J. J. Gordon and George M. Prince, creators of synectics. Royal Little, founder of Textron, Inc.
Merrill Cook, former member of the United States House of Representatives from Utah. Karl P. Stevenson, Arthur D. Little's president and chairman of the Ad Hoc Committee on Chemical and Biological Warfare that in 1950 expedited the creation of Camp Detrick's Special Operations Division that consolidated chemical and biological warfare projects in one location. ^ Arthur D. Little. "Arthur D. Little: Locations". ^ "Locations". 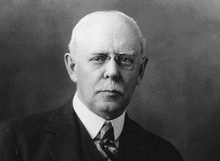 Arthur D. Little. Retrieved August 17, 2018. ^ Little, A.D.; Griffin, R.B., "The Chemistry of Paper-Making, together with the principles of general chemistry; a handbook for the student and manufacturer", New York : Howard Lockwood & Co., 1894. ^ "Arthur D. Little, Inc.: Exhibits: Institute Archives & Special Collections: MIT". libraries.mit.edu. ^ "COMPANY NEWS; Plenum Bidding for Arthur D. Little". 14 July 1987. ^ "The Birth of Management Consulting - The MIT Campaign for a Better World". ^ Glater, Jonathan (2002-06-02). "Arthur D. Little Plans Bankruptcy Filing". NY Times. Retrieved 2012-07-26. ^ Altran website "The Group signed, on November 1st, 2011, a termsheet for an MBO concerning the disposal of Arthur D. Little due to be finalised by the year-end"
^ "Arthur D. Little announces the successful completion of its Management Buy-Out - Business Wire". ^ "Arthur D. Little Announces More Than 20 New Partners Through External Hiring and Promotions - Business Wire". ^ "Industries". Arthur D. Little. Retrieved April 17, 2017. ^ "Services". Arthur D. Little. Retrieved April 17, 2017. ^ "Best European consulting company to work for-Vault.com". ^ "Best Asian Consulting companies to work for-Vault.com". ^ "America's Best Management Consulting Firms". ^ "Best companies to work for-Vault.com". ^ "Best Asia Pacific companies to work for-Vault.com". ^ Prism is available from its website http://www.adlittle.com/prism-intro.html or free on demand from any of the corporate offices. ^ Little, Arthur D. "Arthur D. Little - Publications: Viewpoints". www.adlittle.com. ^ "Arthur D. Little Study Says External Business Intelligence Boosts Innovation and Profits - The CIO Report - WSJ". WSJ. ^ "Socioeconomic Effects of Broadband Speed" (PDF). Ericsson. September 2013. ^ BBC. "Response: Union Carbide and Dow Chemical". BBC Website. Retrieved 28 February 2013. ^ Laymon, Brent. "Carbide Consultant Says Sabotage Caused Bhopal Tragedy". AP Report. Associated Press. Retrieved 28 February 2013. ^ ^ Jump up to: a b c d e Kalelkar AS, Little AD (1988). Investigation of Large-magnitude Incidents: Bhopal as a Case Study. London: Presented at the Institution of Chemical Engineers conference on preventing major chemical accidents. James Adams (1992). Bull's eye: the assassination and life of supergun inventor Gerald Bull. (Chapter Seven) Times Books. E. J. Kahn, Jr. (1986). The Problem Solvers. Little Brown.